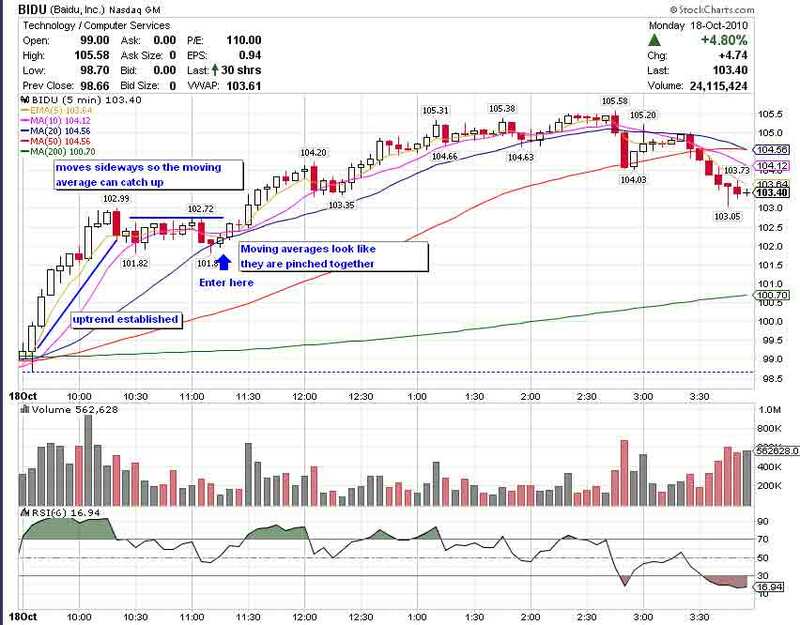 Over at StockBee, we were discussing various entry tactics and touched on the topic of using moving averages to enter a stock during the day. First, and most importantly I am not a day trader, this is a tactic I use for swing trading (2 day to several week holding periods). This tactic is more for fine tuning entries and exits and overall a minor part of the entire strategy. Looking at an intra-day chart on any given stock, you can break down the movements to similar patterns we use for swing trading. For instance, in the example below you can see a bull flag form between 9:30 a.m. and 11:00 a.m.
You could trade this many different ways, waiting for a new high to form between 11:00 - 11:30 or use a moving average entry signal. 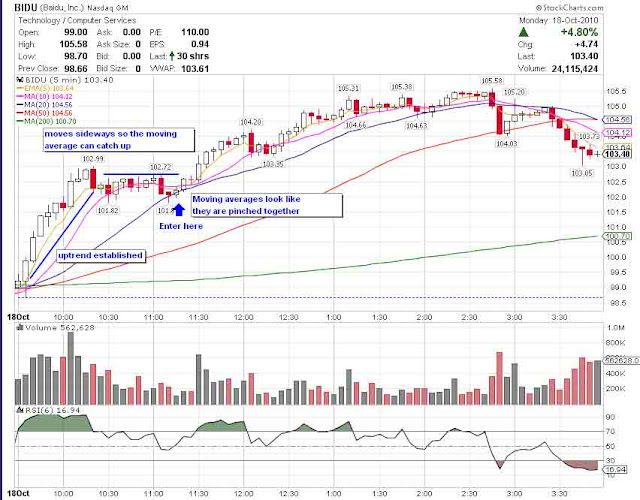 I look for the moving averages to join together, like someone pinching them together (see 11:15). As you can see it took off soon after bouncing off these support levels. The more moving averages that come together, the more I like that entry point. Watch these moving averages after entry. For instance, during the end of the day BIDU crossed under it's 50 period ma which shot up some red flags for me. We'll see what happens tomorrow. Dan thanks for the How to tutorial. I will add that SMA Squeeze to my 5min chart watch. For years I've watched the 5min SMA50/200 for a CrossUp for entry. Seen too many times the 50 came up to the 200 then turned back down. Once Xup occurs I feel safe (normally) for a 3 day run of some sort before that turning back down which you describe. thanks Art. I've also been looking at a shorter RSI(6) indicator for entry. Still testing with it.